It’s been sixty-nine years, today, since about 73,000 American military personnel (along with tens of thousands of Allied Troops) stormed the six beaches of Normandy. How many of you knew this before seeing it scroll across the bottom of the news screen today or until I just told you? Good for those of you who did. Seemed like a fitting day for a post with three vignettes connected by nothing but a single thread. Can you tell what it is? Readers, you have my Mother and Father to blame for the pontificating about to commence. Okay, you need to add my Dad’s Dad and my Mom’s Dad and a few Great Uncles on both sides. Why? All Veteran’s of this United States. My family, in just two generations (I don’t have many facts about those before), chose to serve this Nation in the Marine Corps, Navy and Army. In school, when kids taunted each other with, “Your mom wears combat boots,” I said, “Yeah, she does.” I was proud she was a Marine. The rich history in my family has given me an unshakeable respect for our military. When I walk or run past someone in uniform, no matter where or when, I say, “Thanks for your service.” Since I have some close ties with the Marine Corps, I shout out a quick, “Semper Fi,” if I can tell it’s a Marine. Memorial Day, Veteran’s Day and the Marine Corps Birthday are automatically remembered and celebrated as much, if not at times more, than other holidays or birthdays in my family. Every year for as far back as I can remember, Sunday night before Memorial Day was spent in front of the glowing screen in the living room while PBS broadcast the National Symphony Orchestra’s Memorial Day Concert from the lawn of the Capitol in Washington DC. Each story shared over the airwaves sparked a short dissertation from my Mom about that topic. She talked about her Dad and his time in Korea and “Uncle Clarency” and his time in Vietnam. 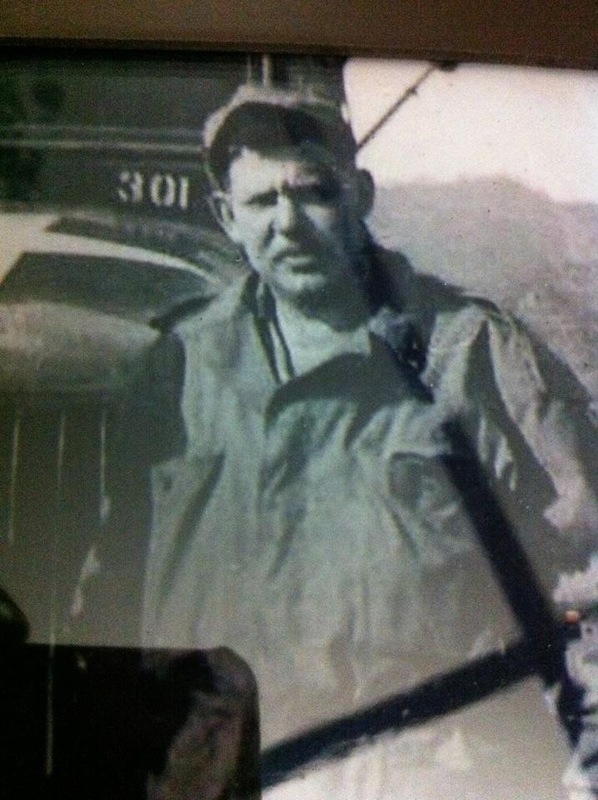 I never met my Grandpa Bob, but the image of him burned in my mind is that of the photograph Mom carries in her wallet: a uniformed man standing next to a large military truck in an unknown land. As for Uncle Clarency, his quiet integrity makes it impossible for anyone to meet him and not instantly have the utmost respect. He doesn’t talk about his time in the service, but it was one of the most precious moments when I got to watch some of the National Symphony Orchestra’s Memorial Day Concert with he and my Mom at his daughter, Laura’s grill-out last year. Without going into the family military history on the other side, one can easily see why when I was asked if I wanted to run an ultra marathon that benefited the Semper Fi Fund and the Navy Seal Foundation, I said, “Heck yes!” Let’s just say, I had no clue what I was getting myself into but, sometimes, the most wonderful place to find yourself is lost. May 3, 2013: Head down to Prince William Forest to campsite 5. Get settled in, check in for the 24 Hour Adventure Trail Run, have dinner with some other crazy ultra marathoners and get some rest. Seemed pretty tame, right? I was only slightly internally panicked because this was my first ultra and because I’d had this nagging pain in my knee since the DC Rock and Roll Half Marathon I did in March. Brian and I chatted with the race organizers and some of the other runners. The food was delicious, but my motivation for the weekend was about to materialize. A family member of a fallen Navy Seal was to speak after dinner but was caught in traffic. Rather, a former Marine who was a participant agreed to say a few words. He told the story of an attack on a US convoy. For super secret reasons, I must refrain from sharing the details of the story, but what he said next will resonate with me forever. One of the Marines said, when radioed to ask after his status, “I stepped on an IED, my legs are gone and I’m ok.” This kid who just had his legs blown off was directing help away from himself and toward others who needed it more. Talk about a change in perspective. My knee is sore and I’m worried about taking a few miles in the woods. May 4, 2013: The talk around the “ultra world” is that it’s not an official ultra until you run 50k. We were running 10k loops on a trail around Prince William Forest. Very simple math and a little knowledge of my stubborn streak tells you I was determined, come hell or high water, to run 5 loops, at least. The first four loops are full blog posts all on their own. There were plenty of painful times where the only thing that kept one foot in front of the other was me telling myself, “And I’m ok.” That fifth loop was a trip; literally and figuratively. About 300 meters from the line that signified my entrance into the ultra club there was a short foot bridge that crossed a beautiful stream. As I crossed the bridge, I asked Brain to stop for a moment. My first four and most of the fifth loop were fraught with trips, stumbles and two falls from feet, knees and legs not used to the intricate root systems of trail running. I rammed my foot into one root so badly that the pain brought me to my knees. I thought to myself, “And I’m fine.” When Brian turned around and saw my tear-filled eyes after I asked him to stop, he said, “Is it your toes?” As tears rolled down both cheeks, I said, “No, I’m about to be a real ultra marathoner.” He laughed and gave me a tight hug. He then gave me a look that said, “Well, let’s get to it,” and we took off toward the line. If you’re interested in getting involved in ultras, I’d suggest an ATR event HANDS DOWN. Groups had placed countless red flowers about all the Memorials reminding me of the original name for Memorial Day: Decoration Day. 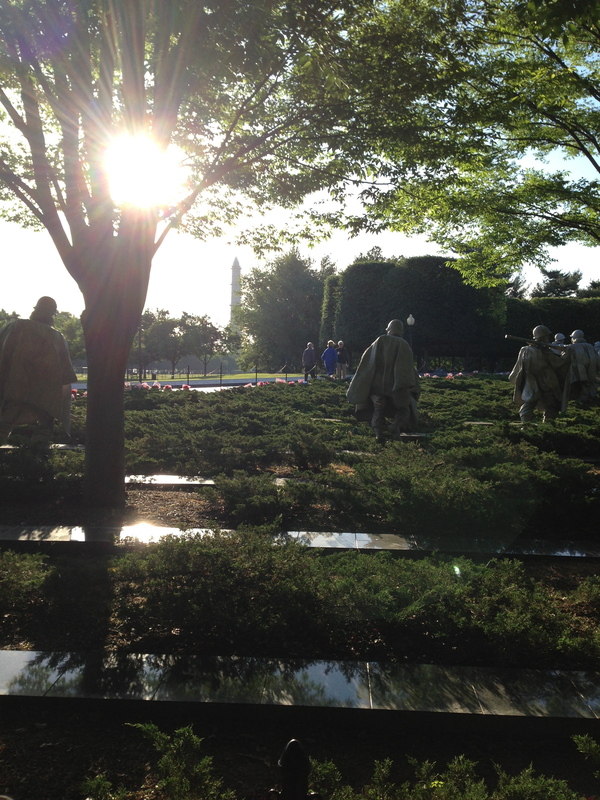 I was awestruck by the vision at the Korean War Veterans Memorial. 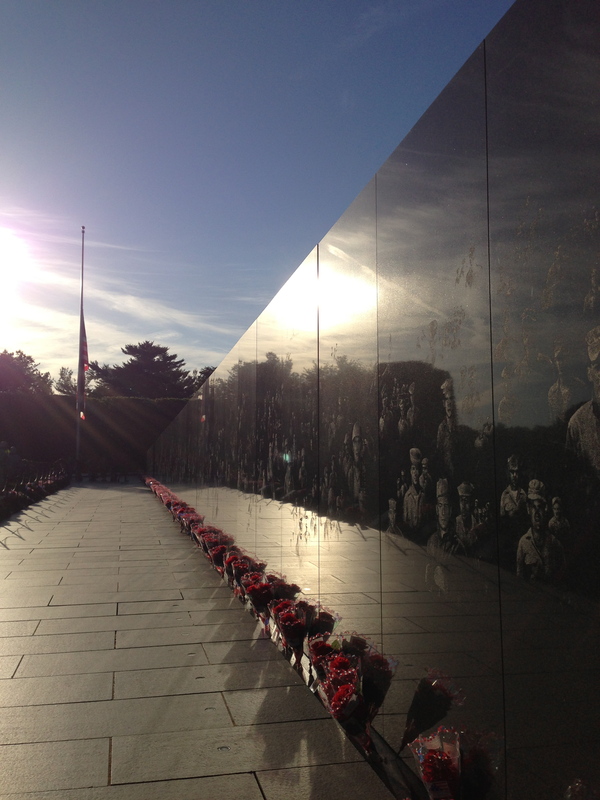 The sun was climbing in the sky casting an eerie realism over the statues, wall and pool that compose the Memorial. I didn’t get any photos of the Vietnam Veterans Memorial Wall. 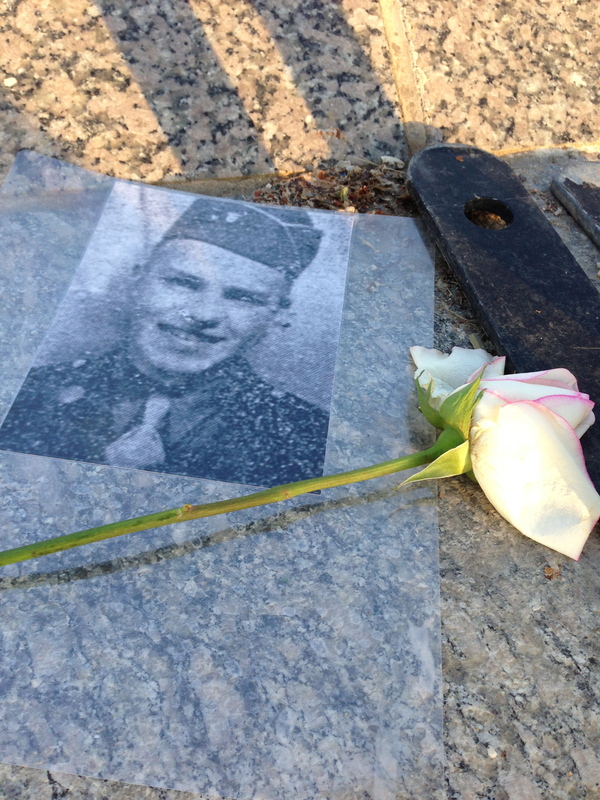 When Brian and I initially walked to the Memorial, we saw all the mementos left by the members of Rolling Thunder. I saw a man with a scrap of paper. I watched him count the rows from the top of the wall until he got to the number scrawled on the paper. He counted over and his face betrayed him. He’d found the name he was looking for. He gently rested his fingers on the cold etched stone. He stood himself up a little taller, tucked in his shirt, adjusted his hat and left the Memorial. I can describe the situation but I’ll never be able to convey how honored I was to be able to witness that precious moment. A thousand flowery words will never convey what I felt that day. I hope these photos do a little more justice than my small words. 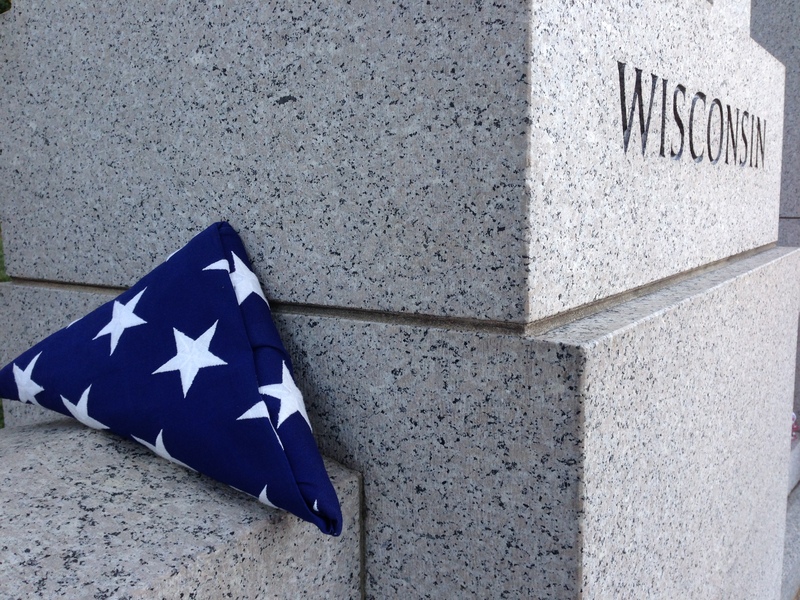 Live everyday to the fullest to honor their sacrifice.